Hair Treatment Serums There are 10 products. Savannah Tropic - Kalahari Melon Hair Serum is light and absorbs quickly. It is non-greasy and leaves no residue. Benefits: Suitable for natural hair, weaves, wet and dry hair Nourishes and conditions hair. Non-greasy formula. 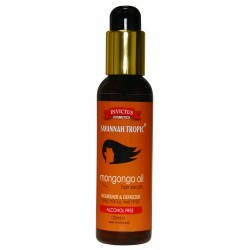 Savannah Tropic - Mongongo Oil Hair Serum is ideal for hydrating and protecting hair. The serum is infused with exotic essential oils which moisturises hair leaving it looking healthier and feeling softer. 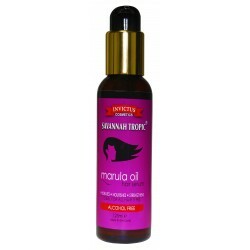 Savannah Tropic - Pure Marula Oil Hair Serum is specially formulated to nourish, hydrate and strengthen weak hair. 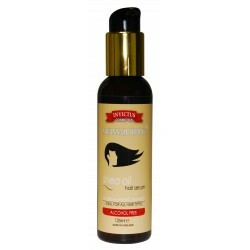 It is infused with Marula Oil which is rich in nutrients necessary for healthy hair. It eliminates frizz and helps mend split ends while adding shine for a healthy look. It is light and is perfect for styling hair. Savannah Tropic - Shea Oil Hair Serum is uniquely formulated using shea oil to maximise hair nourishment, protection and conditioning. Savannah Tropic - Carrot Hair Growth Oil is uniquely formulated for hair growth, anti-hair thinning and repairs damaged hair. 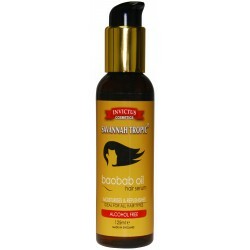 It is enriched with Argan Oil, proteins, Vitamins A and E to help strengthen, condition and promote hair growth. Savannah Tropic - Argan Oil Hair Serum cheers up the hair with instant radiance, silky shine and locks in moisture. This unique hair serum is infused with Argan Oil from Morocco. Argan Oil is extremely rich in Vitamin E, sterols and polyphenols which are essential for healthy hair. Savannah Tropic - Argan Oil Heat and Straightening Hair Serum nourishes and repairs damaged and over processed hair. This uniquely formulated hair serum is ideal for use with hot combs, flat irons and heat styling tools. Savannah Tropic - Argan Oil Therapeutic Hair Serum is specially formulated to mend split ends and it revives hair leaving it glossy and shiny. Superb for damaged and dry hair. Savannah Tropic - Argan Oil Elixir Hair Serum is uniquely formulated with nourishing hemp oil and it's an intensive leave-in treatment. It also conditions and moisturises hair.